The Southern Ocean dominates the mean global ocean sink for anthropogenic carbon, but its sparse sampling relative to other basins limits our capacity to quantify carbon uptake and accompanying seasonal to interannual variability, which is critical to predicting future ocean carbon uptake and storage. Since 2002, underway pCO2 measurements collected as part of the Drake Passage Time-series (DPT) Program have informed our understanding of seasonally varying air-sea pCO2 gradients and by inference, the carbon fluxes in this region. 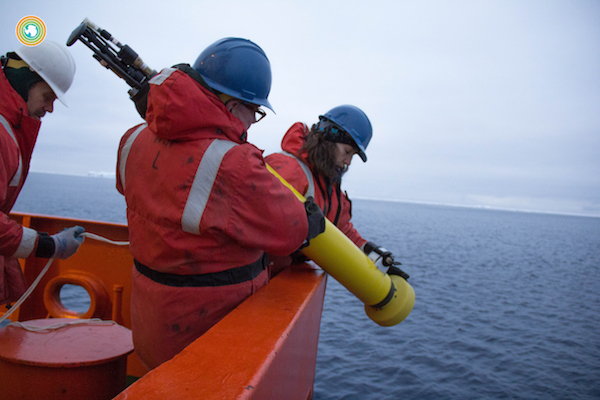 Understanding whether Drake Passage air-sea fluxes are representative of the broader subpolar Southern Ocean was the focus of a recent study in Biogeosciences. 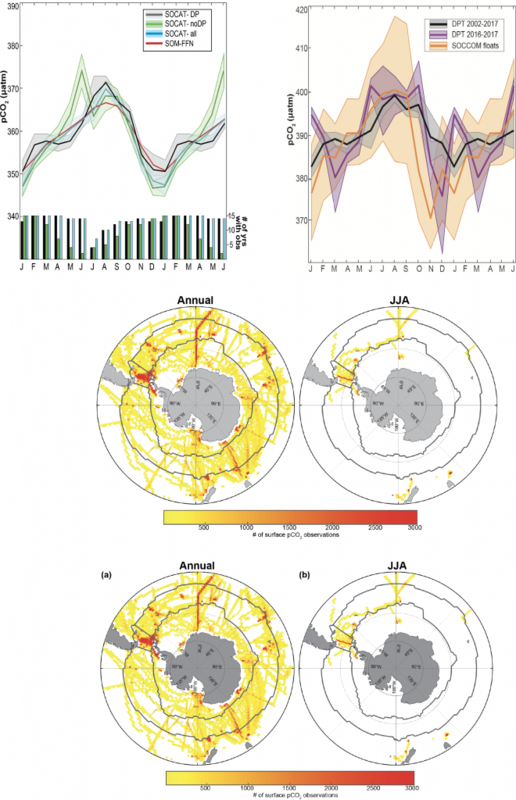 Top left panel: Mean surface ocean seasonal pCO2 cycle estimate for datasets from the Surface Ocean CO2 Atlas (SOCAT) in the subpolar Southern Ocean: black- SOCAT within the Drake Passage (DP) region; green- SOCAT outside the DP region; blue- all SOCAT in Southern Ocean Subpolar Seasonally Stratified (SPSS) biome; red- Self Organizing Map Feed-forward Network (SOM-FFN) product. Shading represents 1 standard error for biome-scale monthly means driven by interannual variability. Bar plot indicates the number of years containing observations in a given month (maximum of 15 years). 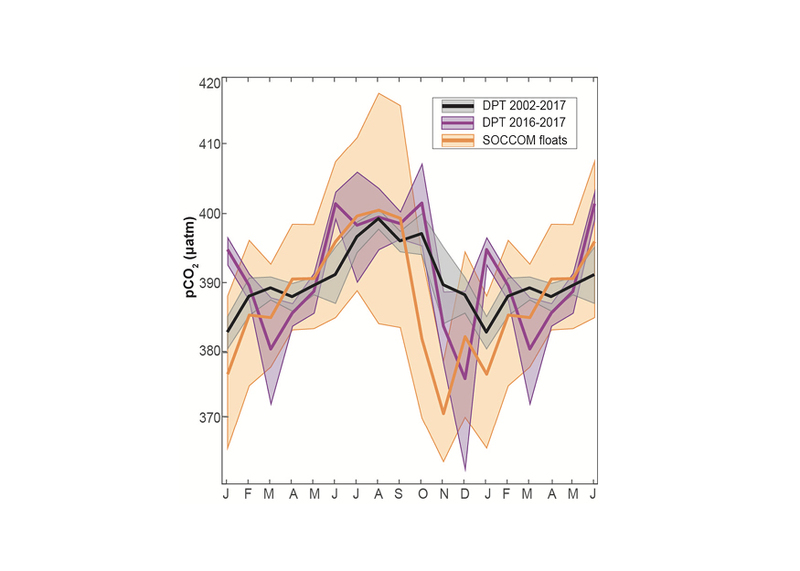 Top right panel: Mean surface ocean pCO2 seasonal cycle estimate for black: underway Drake Passage Time-series data for years 2002–2016; purple: DPT for years 2016–2017 to match years covered by the floats; and orange: SOCCOM floats. Seasonal cycles are shown on an 18-month cycle, calculated from a monthly mean time series with the atmospheric correction to year 2017. Shading represents 1 standard error accounting for the spatial and temporal heterogeneity of the sample and the measurement error (2.7 % or ±11 µatm at a pCO2 of 400 µatm for floats; ±2 µatm for DPT data) combined using the square root of the sum of squares. An analysis of available Southern Ocean pCO2 data from inside vs. outside the Drake Passage showed agreement in the timing and amplitude of seasonal pCO2 variations, suggesting that the seasonality so carefully recorded by DPT is in fact representative of the broader subpolar Southern Ocean. DPT’s high temporal resolution sampling is critical to constraining estimates of the seasonal cycle of surface pCO2 in this region, as wintertime underway pCO2 data remain sparse outside the Drake Passage. Comparisons of the DPT data to an emerging dataset of float-estimated pCO2 from the SOCCOM (Southern Ocean Carbon and Climate Observations and Modeling) project showed that both shipboard and autonomous platforms capture the expected seasonal cycle for the subpolar Southern Ocean, with an austral wintertime peak driven by deep mixing and a summertime low driven by biological uptake. However, the seasonal cycle derived from float-estimated pCO2 has a larger seasonal amplitude compared to the DPT data due to an earlier and much lower observed summertime minimum. The Drake Passage Time-series illustrates the large variability of surface ocean pCO2 in the Southern Ocean and exemplifies the value of sustained observations for understanding changing ocean carbon uptake in this dynamic region. 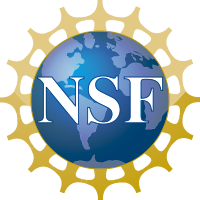 Coordinated monitoring efforts that combine a robust ship-based observational network with a well-calibrated array of autonomous biogeochemical floats will improve and expand our understanding of the Southern Ocean carbon cycle in the future. The presence of large-scale Ekman downwelling is the textbook explanation for low nutrient concentrations, and hence low productivity, in subtropical gyres. However, recent research has suggested that mesoscale eddies oppose and substantially reduce this downwelling, a process known as eddy cancellation (Doddridge et al, 2016). 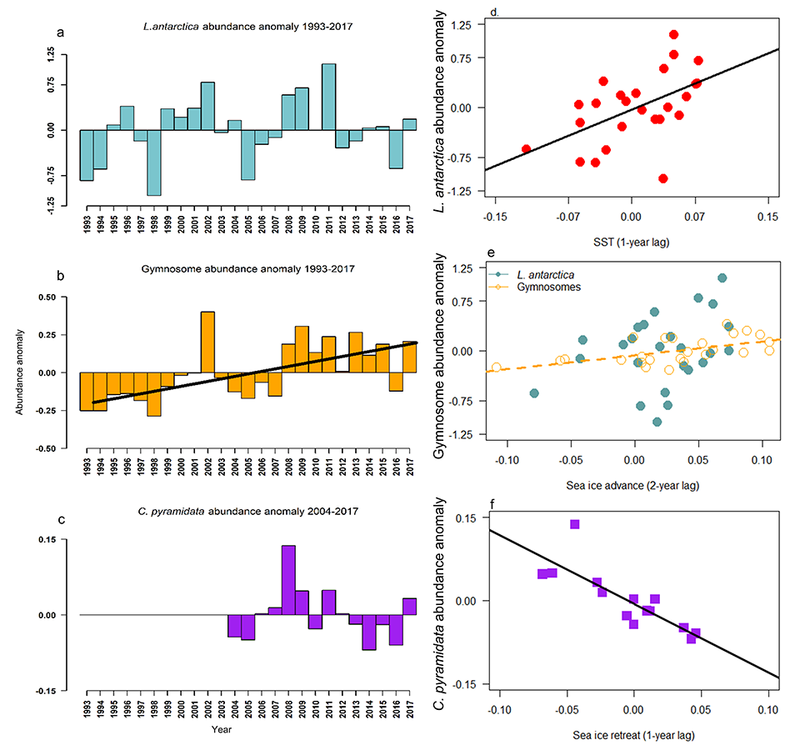 Eddy cancellation represents a substantial alteration to the widely accepted notion of large-scale Ekman downwelling in subtropical gyres, and motivates our study of the processes that determine nutrient concentration within subtropical gyres. 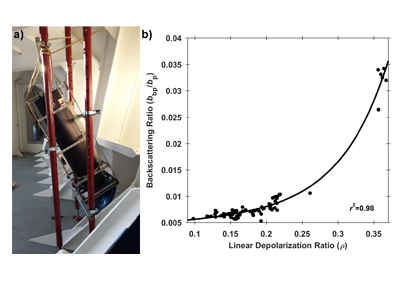 Figure 1: Sensitivity experiments for mode water thickness (hmode) with two values of residual Ekman pumping. a) With no residual Ekman pumping, phosphate concentration responds strongly to mode water thickness. b) When Ekman pumping is strong, phosphate concentration does not depend on mode water thickness. The dashed lines represent transects of climatological phosphate concentration in the euphotic zone of the North Atlantic subtropical gyre (Garcia et al., 2013). 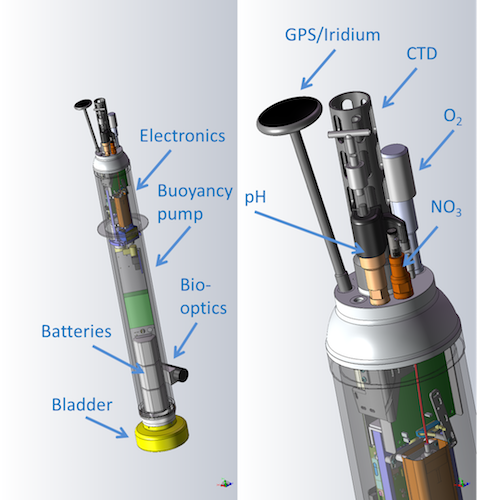 A recent paper published in the Journal of Geophysical Research: Oceans and featured in an MIT News article describes an idealized model for nutrient concentration in subtropical gyres that can account for this reduction in Ekman pumping. 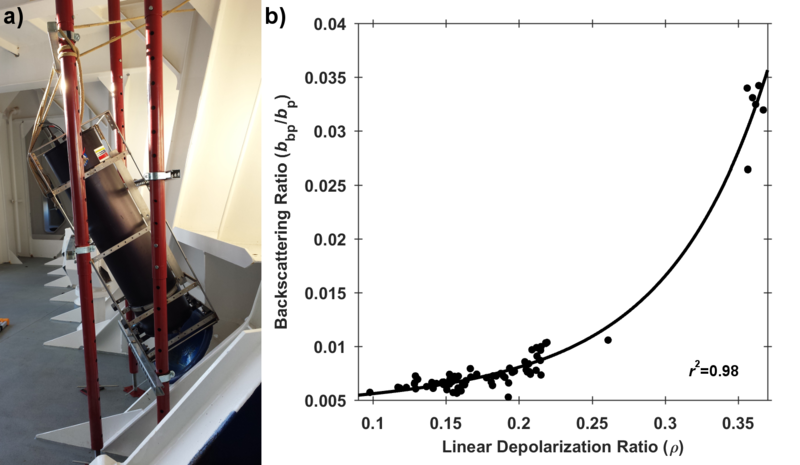 The model predicts that surface productivity is sensitive to the thickness of the underlying subtropical mode water layer, provided that the residual Ekman pumping is small (Figure 1). 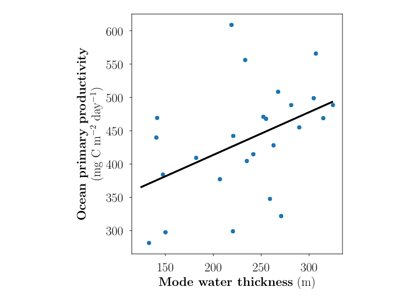 Comparison of this prediction with observations from the Bermuda Atlantic Time series Study (BATS) shows that surface productivity increases as the thickness of the underlying mode water increases (Figure 2), as predicted by the idealized model in the absence of substantial Ekman pumping. Figure 2: Annually averaged primary productivity and mode water thickness from the BATS dataset. 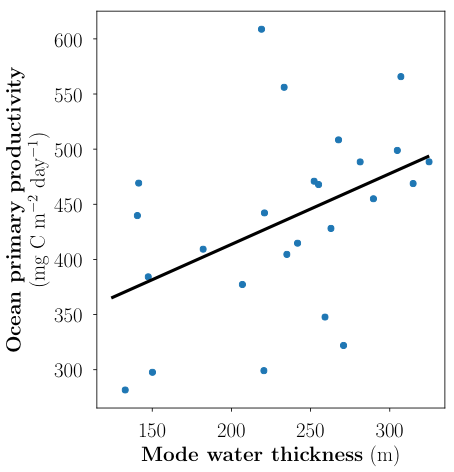 The linear fit between mode water thickness and primary productivity is statistically significant (p ≈ 0.027) and explains 19.5% of the variance in primary productivity. The observed relationship between productivity and mode water thickness at BATS is consistent with a small residual Ekman pumping, indicating highly effective eddy cancellation in the subtropical North Atlantic. Previous research (Palter et al., 2005) has suggested that as the subtropical mode water layer thickens, it blocks nutrient entrainment from below, resulting in lower productivity in the euphotic zone. However, this study suggests that a thicker subtropical mode water layer actually increases the surface nutrient concentrations by promoting more effective recycling of nutrients within the gyre. With a thicker mode water layer, more of the nutrients in the particulate flux are remineralized before they pass through the thermocline and become isolated from the surface ocean. This means that a thicker mode water layer leads to higher nutrient concentrations and supports primary productivity in subtropical gyres. 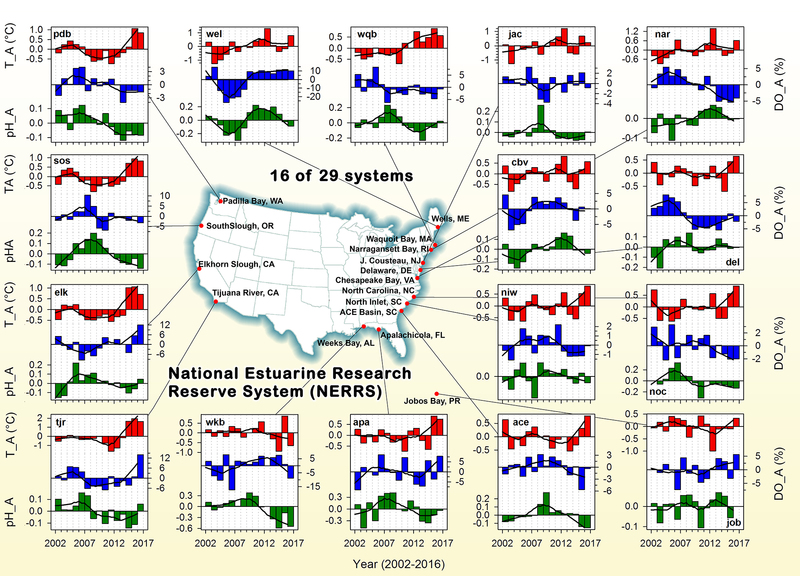 This represents a fundamental change in our understanding of how nutrients are supplied to the surface waters of subtropical gyres. 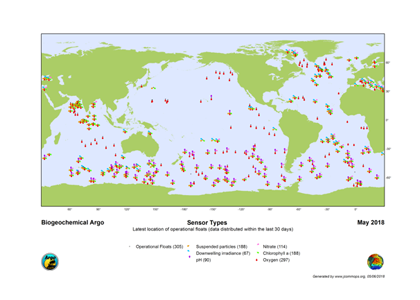 Relative to their surface area, coastal regions represent some of the largest carbon fluxes in the global ocean, driven by numerous physical, chemical and biological processes. Coastal systems also experience human impacts that affect carbon cycling, which has large socioeconomic implications. 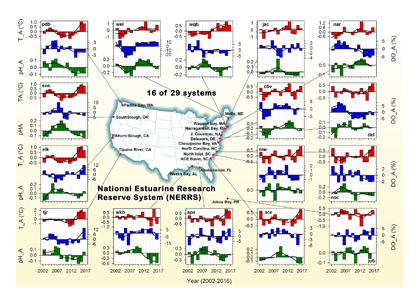 The highly dynamic nature of these systems necessitates observing approaches and numerical methods that can both capture high-frequency variability and delineate long-term trends. Figure 1: The South Atlantic Bight (SAB) was divided into four sections using isobaths: the coastal zone (0 to 15 m), the inner shelf (15 to 30 m), the middle shelf (30 to 60 m), and the outer shelf (60 m and beyond). 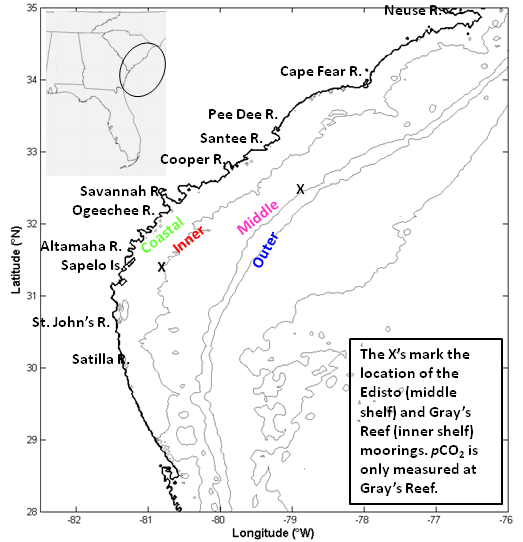 The X’s indicate the locations of the Gray’s Reef mooring (southern X) and the Edisto mooring (northern X). In two recent studies using mooring- and ship-based ocean CO2 system data, authors observed that pCO2 is increasing from the coastal zone to the outer shelf of the South Atlantic Bight at rates greater than the global average oceanic and atmospheric increase (~1.8 µatm y-1). 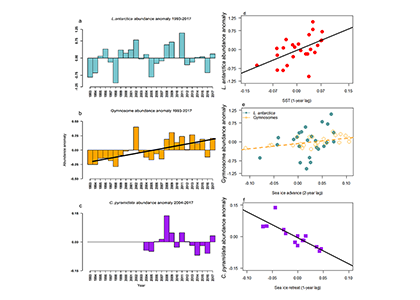 In recent publications in Continental Shelf Research and JGR-Oceans, the authors analyzed pCO2 data from 46 cruises (1991-2016) using a novel linear regression technique to remove the seasonal signal, revealing an increase in pCO2 of 3.0-3.7 µatm y-1 on the outer and inner shelf, respectively. 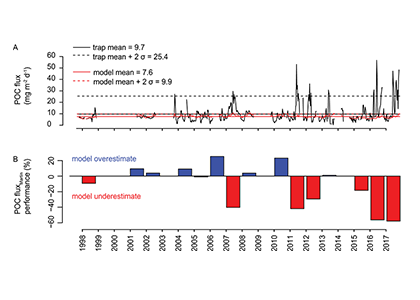 Using a Generalized Additive Mixed Model (GAMM) approach for trend analysis, authors observed that the rates of increase were slightly higher than the deseasonalization technique, yielding pCO2 increases of 3.3 to 4.5 µatm y-1 on the outer and inner shelf, respectively. The reported pCO2 increases result in potential pH decreases of -0.003 to -0.004 units y-1. 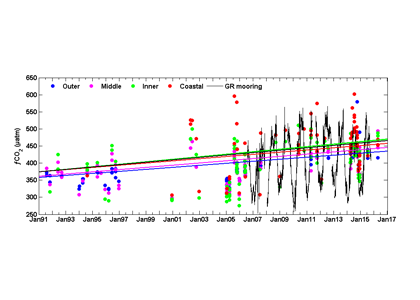 Figure 2: The time series of fCO2 in the four regions of the SAB (cruise observations) and from the Gray’s Reef mooring on the inner shelf indicate an increase across the shelf. 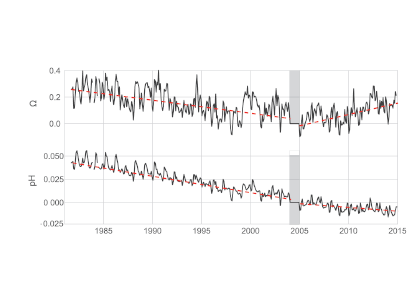 These data are the observed values, however, the trend lines for each time series are calculated using deseasonalized values using the reference year method. 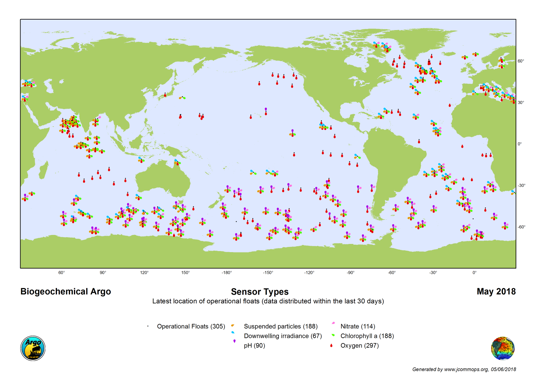 Analysis of the pCO2 time-series from the Gray’s Reef mooring (using a NOAA Moored Autonomous pCO2 system from July 2006 -July 2015) yielded a rate of increase (3.5 ± 0.9 µatm y-1) that was comparable to the cruise data on the inner shelf (3.7 ± 2.2 and 4.5 ± 0.6 µatm y-1, linear and GAMM methods, respectively). Validation data collected at the mooring suggest that underway data from cruises and the moored data are comparable. Neither thermal processes nor atmospheric dissolution (the primary driver of oceanic acidification) can explain the observed pCO2 increase and concurrent pH decrease across the shelf. Unlike the middle and outer shelves, where an increase in SST could account for up to 1.1 µatm y-1 of the observed pCO2 trend, there is no thermal influence in the coastal zone and inner shelf. 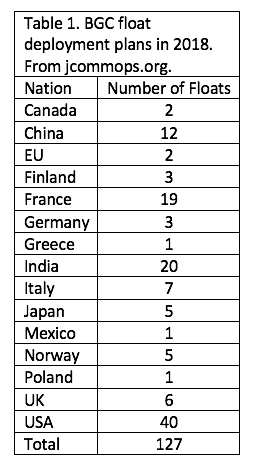 While 1.8 µatm y-1 could be attributed to the global average atmospheric increase, the remainder is likely due to transport from coastal marshes and in situ biological processes. 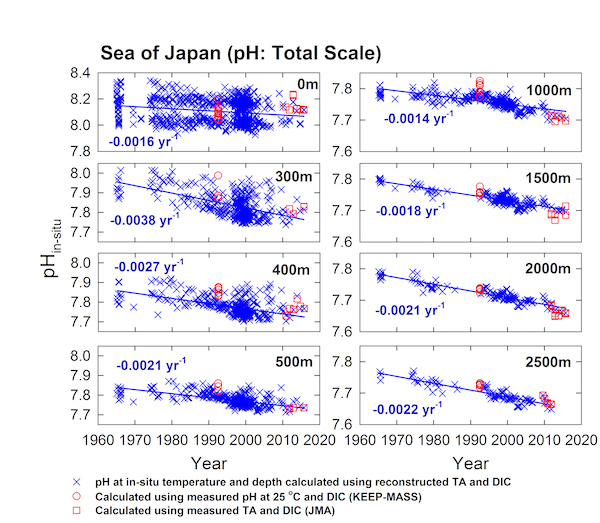 As the authors have shown, the increasing coastal and oceanic trend in pCO2 can lead to a decrease in pH, especially if there is no increase in buffering capacity. 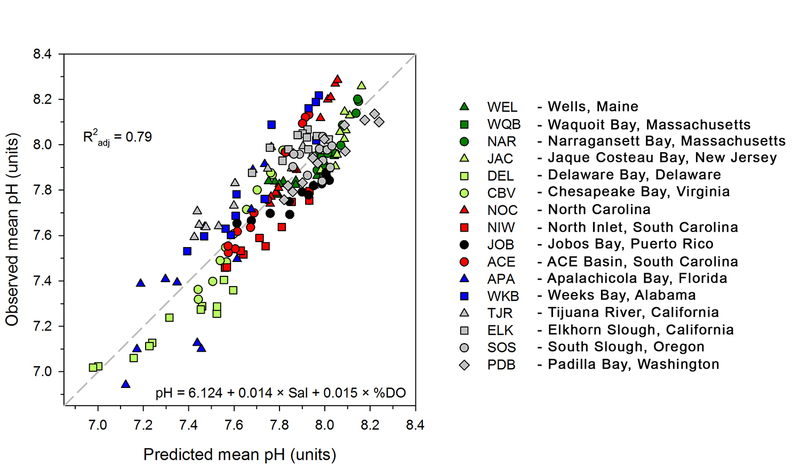 More acidic waters can have a long term affect on coastal ecosystem services and biota. Oceans worldwide are warming up, and thermohaline circulation is expected to slow down. At the same time, ocean acidity is increasing due to the influx of anthropogenic carbon dioxide (CO2) from the atmosphere, a phenomenon called ocean acidification that has primarily been documented in shallow waters. In general, deeper waters contain less anthropogenic CO2, but predicted reductions in ventilation of deep waters may impact deep ocean chemistry, as described in a recent study in Nature Climate Change. 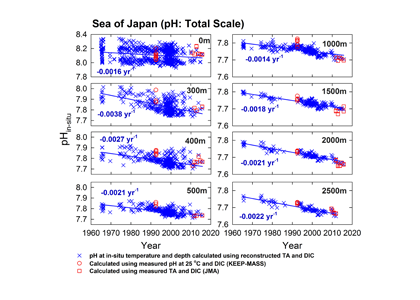 Figure caption: Secular trend of total scale pH at in-situ temperature and pressure at various depths between 1965 and 2015 in the Sea of Japan. The Sea of Japan is a marginal sea with its own deep- and bottom-water formation that maintains relatively elevated oxygen levels. 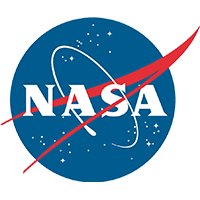 However, time-series data from 1965-2015 (the longest time-series available) reveal that oxygen concentrations in these deep waters are declining, indicating a reduction in ventilation that increases their residence time. As organic matter decomposition in these waters continues to accumulate more CO2, the pH decreases. As a result, the acidification rate near the bottom of the Sea of Japan is 27% higher than at the surface. As a miniature ocean with its own deep- and bottom-water formation, the Sea of Japan provides insight into how future warming might alter deep-ocean ventilation and chemistry.